Just a quick chart check. If the sub-divisions marked are correct, we should see 4750-20 get breached soon, may be as early as this week. For medium to long-term please check the September and August post. Some of you have requested my short term view on Nifty and here goes. 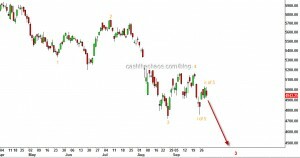 The upward correction that started from 4720 saw some serious selling pressure on Friday. It is possible that this correction may have ended as per the red scenario and a new low may be coming. Alternately, the upward correction may have a little more juice before another new low for the year comes through(orange scenario). 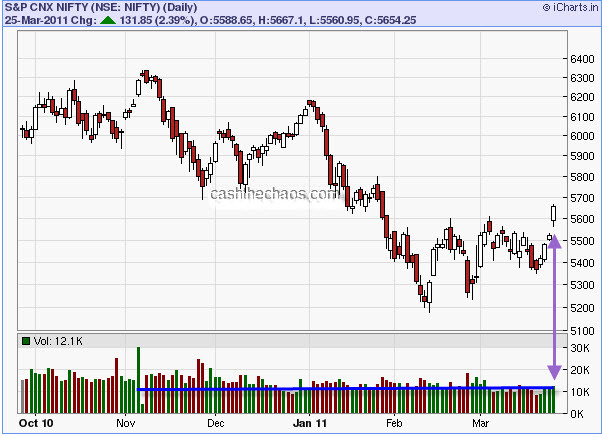 So if anyone decides to go short, they need to do be ready with money management strategy around the 4900 zone of Nifty. While we are here let us also look at the INR charts. The pace and steepness of the USD's appreciation against the rupee has all the signs of an impulsive move. You might want to go back and refer to our Aug 26th post on the INR for the bigger picture. As some of you would have noticed from the comments section, I consider the breakout in the dollar index a significant contributor to the global bear case. After building a base for 3 months, the dollar index has broken out of a range. This is likely to accentuate the risk aversion across various asset classes. Given the strength in the dollar index and weakness in rupee - I will not be surprised if a new low comes through in the month of September for equity markets. PS: Ill be on Bloomberg-UTV today at 8:30 IST. I'm posting this update on Nifty from my holiday spot in Bangkok, so this will be short. On the charts above, note those small violet squares (you may want to click on the chart for a zoom) that mark the swing highs and lows. This is how waves progress, each move moving beyond the extremes of the previous move and in a five step fashion. So, I'm treating the current move as a corrective move to the decline of 5944 to 5195 and not as a trend change. If you heard me on CNBC on 20th June, the day markets hit 5195, I had expected a reaction to 5485 but this one has been stronger than that. Nevertheless, it would have prepared you to go slow on the bearish side. 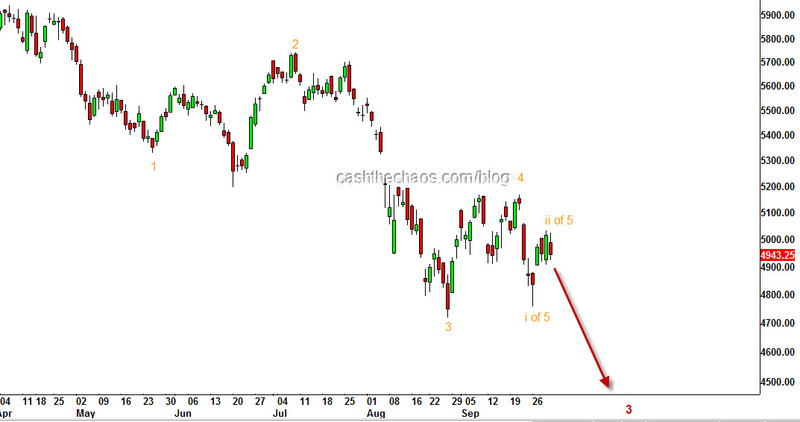 Going ahead, the rise from the June 20th low should remain "a three" for the bearish case. Hence, we should expect Nifty to start reacting lower from the red trendline marked on the chart (5720 and falling by 5 points each trading session) - which would raise the prospects of a descending triangle OR react lower from 5660's. Either case, I would NOT put my feet back on the bearish pedal atleast till I see a lower high registered. I have plotted a couple of possible routes on the chart. Signing out, until my next update from Singapore - man, its really hot here! The Nifty has been in the range of 5600 to 5400 for the sixth week and has kept everyone guessing as to which way the range would resolve. As a good trader, one needs constantly play devil's advocate to your own views. 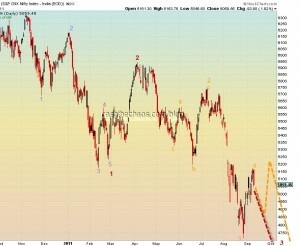 So, here are the charts that present both the bullish and the bearish views. The above Elliot wave count assumes that the November high was only a portion of a larger bull run and further gains are yet to follow. The violet wave 1 ended at the November highs and the subsequent decline into the January lows of 5177 completed the corrective wave violet 2 (which sub divided as a zig-zag red ABC). This would mean that the move to the May high was wave 1 green (impulsive) and is part of the powerful wave 3 violet which is likely to reach levels way beyond the all time highs. Line in sand - If Nifty dips below 5320 it would weaken the bullish case though only a breach of 5177 would completely negate this option. What's in favour? - Despite the global and regional weakness, India has been holding up well in the last few days. What's against? - Reliance and ONGC ,the two heavy weights, are showing weakness. 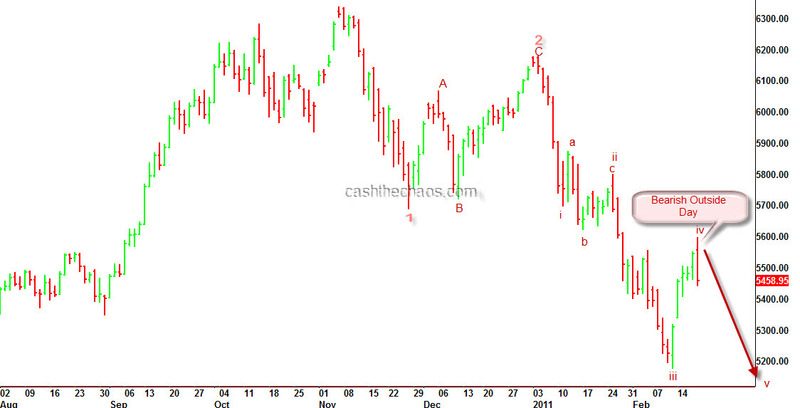 A big negative pattern is under construction in ONGC. The assumed wave count to the May highs is a truncation - which normally does not help the case. The blue dotted trend-line shown is also likely to place a lid on the upward move. The bearish case has multiple options and I have taken the least bearish option. If we assume the November high was the end of violet wave 1, the decline into the January lows was only part of a larger correction Violet A, that sub-divided into red ABC. The rise into May high is assumed as corrective in nature, Violet B (which again sub-divided as blue ABC). The ongoing move from the May high is part of the Violet C wave decline which is expected to sub divide in to 5 waves. Of this 5 waves we have probably completed the first wave of the decline (blue 1 of Purple C) and we are the beginning of a powerful wave 3 (blue 3 of purple C) that would take market below 5000 (black arrows) or the corrective wave 2 is yet to complete(blue dotted path) before the powerful blue 3 of purple C takes Nifty well below 5000. Line in sand - A move above 5650 would weaken the bearish case though only a breach of 5944 would force us to suspend the bearish bets. What's in favour? - Exactly what is against the bullish case favours this - ONGC and Reliance. Also, the Dollar Index seems set for a powerful move that is likely to unleash a destructive move on most risk assets across the globe. What is against? 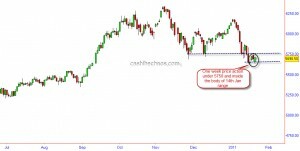 - Nifty has not managed to consolidate on the advantage of taking out the March lows and move briskly below the January lows. PS: If you would like to know which side i'm leaning - i've been on the bearish side since November and I continue to do so. 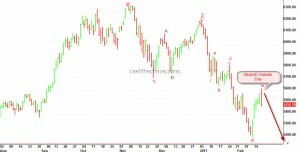 What next for the Nifty? The 2.3% bump UP for the Nifty on Friday was quite smooth and brought a lot of cheer on the streets but the CRITICAL 5690 level still remains unconquered. Given the smart rise of the previous week, it may not seem formidable after all. Nevertheless, we will have to wait and see what the market does. So, let us do a what if scenario. a) What if 5690 is taken out - the bullish case. 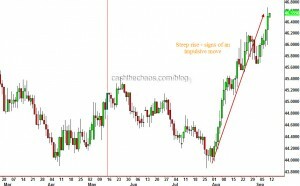 The market structure that we thought was unravelling in this post would not be the case and markets would continue to head higher. The problem here is, the market has spent more days between 5600 and 5200 than it took to decline from 6182 to 5177. So it is looking more like a short-term bullish picture. And the question - How much higher? It could be around the region of 5900 but may not be much higher. 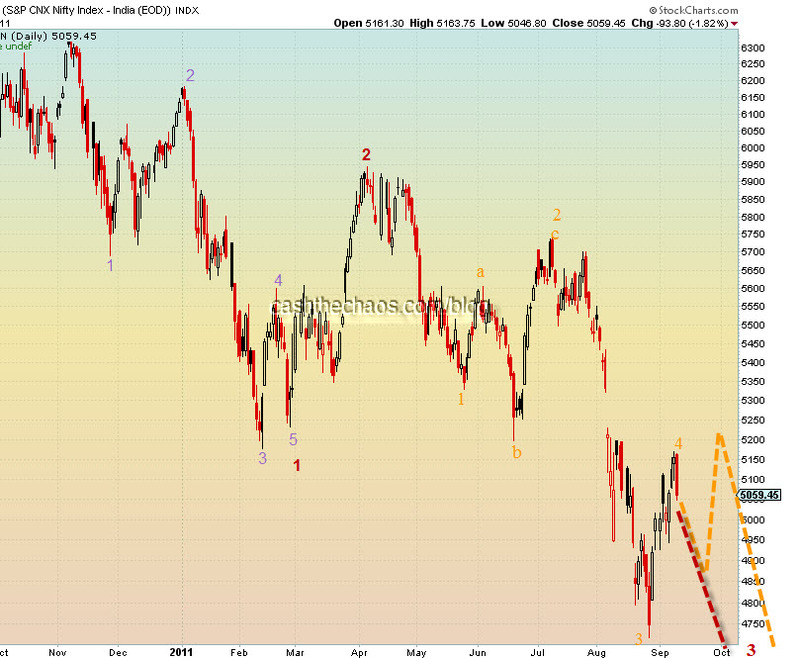 b) What if 5690 is not taken out - the bearish case. Obviously the old targets would still be alive while we may still have to see if we need to slightly review the market structure. But the markets need a quick decline - the longer Nifty holds above 5600, the odds of the bears losing advantage would increase. A couple of things that needs to pointed out here. Firstly the volume of the short-term breakout did expand slightly, it was nothing exceptional as the media is projecting it to be (see the horizontal blue line on charts). Secondly, while the small caps and mid-caps tend to follow the large caps, they are yet to clock higher highs - risk taking is not yet back, at-least so far. If you are a wave fan, you would note that this decline is coming after a 5 wave advance and this decline below 1352 marks the beginning of a strong decline. We are expecting the shiny metal to find initial support around the June highs of 1265. The Indian stock markets though had an advancing week, people have to pay attention to the range of last week. The whole of last week markets meandered under the range of previous Friday's(the day it breached key support at 5690) range!!! 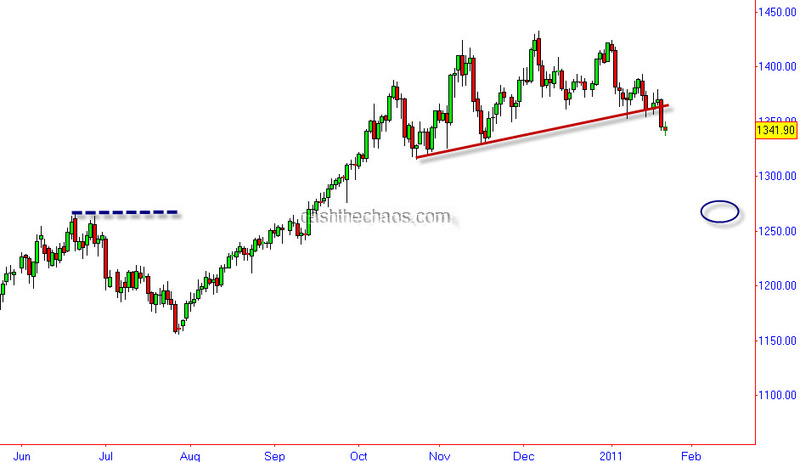 If this is not bearish consolidation, what is?? In my interaction with CNBC TV-18 on 19th January, I did highlight that the Indian markets may have slipped into a bear market. Strangely(!) it did not find any recap in their website ! 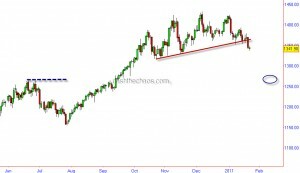 Regular readers of this blog would recall that I had highlighted in my November post itself (now Password unlocked) that the Indian markets had peaked and a bearish phase was a distinct possibility. A couple of weeks back I had posted a note on my own derived indicator and highlighted how important it was for the indicator to hold above the previous trough. On Friday, this indicator dipped below the previous trough on a closing basis and has warned that the Indian markets have probably peaked and a bearish phase is a very distinct possibility. So naturally one has to ask - how has this indicator fared in the past? 1) In 1999 - the indicator peaked in Oct 1999, and warned of a bear market a few weeks before Sensex and Nifty peaked. 3) In 2006, during the infamous sharp drop in May this indicator stood its ground. 4) In Oct/Nov 2007, this indicator warned of an oncoming bear market. The Indian markets peaked in Jan 2008. It is often a good idea to look at other inter-related markets before coming to a conclusion about a major trend-shift. And here is where the fixed income /bonds come into the picture. Here is a chart of the 10 year OIS swaps. As is evident from the chart, there is still an intense struggle to cross the 200 DMA. AND when stock markets were trading near the all time high, the 10yr swaps were actually miles away from the peak made in February! If stocks are that attractive why are investors still seeking the safety of fixed income? In 2010, emerging markets have had 2 significant corrections prior to November. One in Jan-Feb and the other one in Apr-May. The gross short interest in MSCI EM was 15% lower at November peak when compared with the January peak. That is a substantial level of complacency!! Let us also look at Gold which can give us a fair idea of inflationary/deflationary pressures in the global economy. 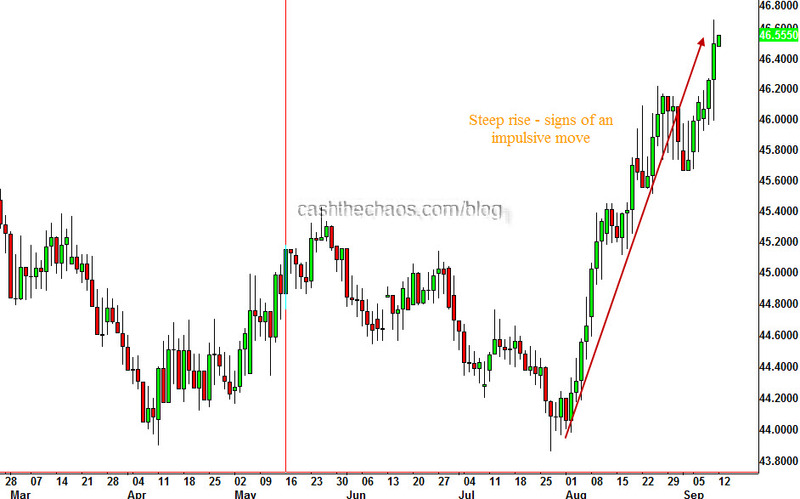 Gold Daily Charts - A potential H&S top? 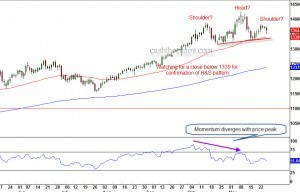 The daily charts of Gold shows us that the swing to 1425 is in disagreement with the momentum readings. 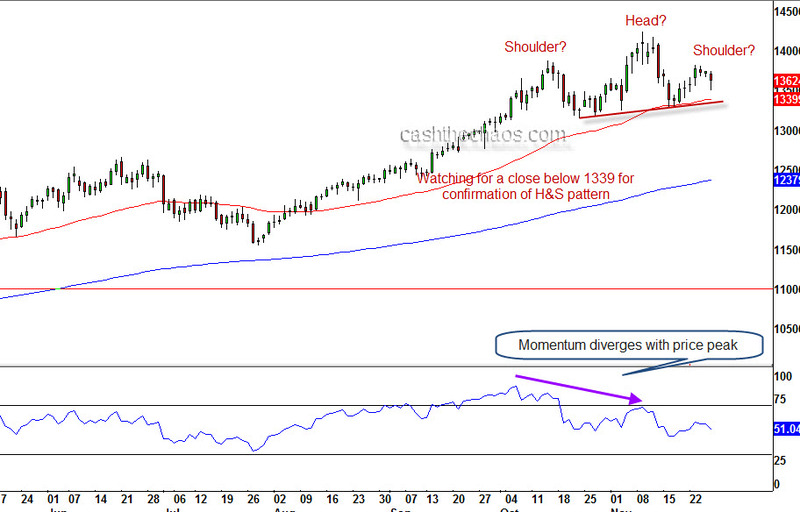 We can also see the potential for a Head and Shoulder top formation. A close below the neckline, currently at 1340, is likely to augment further selling and a minimum drop to 1225 level is the expected outcome of such a breach. Nifty is now the second worst performer amongst its Asian peers (taking USD into account) only behind the Philippines Index. In absolute terms, at the third place behind Philippines and China. Although on a quarterly/half yearly and Annually the Indian Indices are scoring handsome gains, what a swift reversal in performance! Anybody there who does not believe in Momentum?